Injiri works with hand-loom textiles for clothing and home. 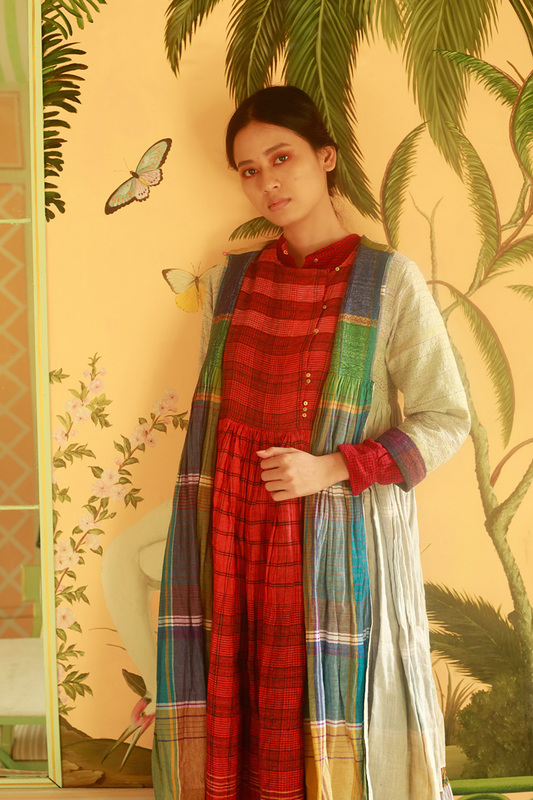 The label is entirely based on the idea of celebrating the process of hand-woven and hand-crafted Indian textiles; the clothes are little stories about the textiles they are made of, and are reflective of the process that goes into making of their textiles. India has been the producer of highly skilled textiles for many centuries and these textiles have travelled the world. Injiri is a colloquial pronunciation of the word"india". It is a historic word for "real madras checkered textiles" that were exported from South India to west Africa in the 18th century. The name “in-jee-ree” is suggestive of the idea of Indian textiles being prized possessions of people all over the world. The label believes in working within the limitations of the techniques to create beautiful products. It means to allow the technique to generate innumerable possibilities of how beauty can be achieved. It could be the most obvious or simplest solutions - but in simplicity we think lies absolute beauty. The inspiration for most of the textiles and garments comes from local dressing styles of rural India and other folk cultures from around the world. It is the simplest work - clothes of peasants, tribals and local people that inspire us the most. Most vintage clothes like smocks were made at home or by a local seamstress. In olden days making clothes was a very slow process and allowed the maker to do each piece at leisure - also woven material was a precious commodity and it was used frugally. The “hand-made” quality is very evident and all our products are inspired by that over and over again.